Alabama:	SDS-Tuscaloosa Wins, Anti-war Protesters Acquitted | Fight Back! The protesters - Jason Hurd, member of Iraq Veterans Against the War and SDS members Alyse Deller, Christine Jackson and Jeremy Miller - were arrested and charged with disorderly conduct after a mock raid in which protestors reenacted a typical U.S. military raid on Iraqi civilians common in Iraq under the U.S. occupation. The Tuscaloosa County District Court judge threw out the case after hearing what he called “vague and unclear” testimony from the prosecution’s witnesses. The prosecution attempted to prove that the anti-war demonstration was ‘disruptive’ and constituted disorderly conduct. However, it was clear to the protesters and their supporters that the university was attempting intimidate the activist organization and to silence political speech on campus. For example, one of the prosecution’s witnesses admitted that sororities were allowed to cheer, dance and otherwise cause commotion inside the Student Center without a permit, and yet the campus police were not called. This shows that what mattered was not that the mock-raid was ‘loud,’ but that it conveyed a message about the current situation in occupied Iraq that the university administration found unacceptable. 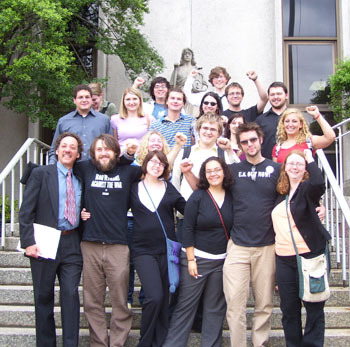 Since the arrests, the Tuscaloosa SDS chapter and lawyers from the Alabama chapter of the American Civil Liberties Union and National Lawyers Guild worked to build a campaign to drop charges against the ‘Ferg Four,’ as the protesters became known, and to fight back against the repressive actions of the university. Before the trial, dozens of members of SDS and supporters picketed outside the courthouse, chanting, “Hey, hey, U of A! How many kids did you jail today?” and holding up signs demanding an end to the war in Iraq. SDS members see the mock raid as part of the effort of students across the country to up the social costs of the war. In recent years, student protests have become increasingly militant, from blocking military shipments out of ports in Tacoma, to occupying the offices and lobbies of war profiteers in D.C. to going on hunger strikes for socially responsible investment at University of Florida.